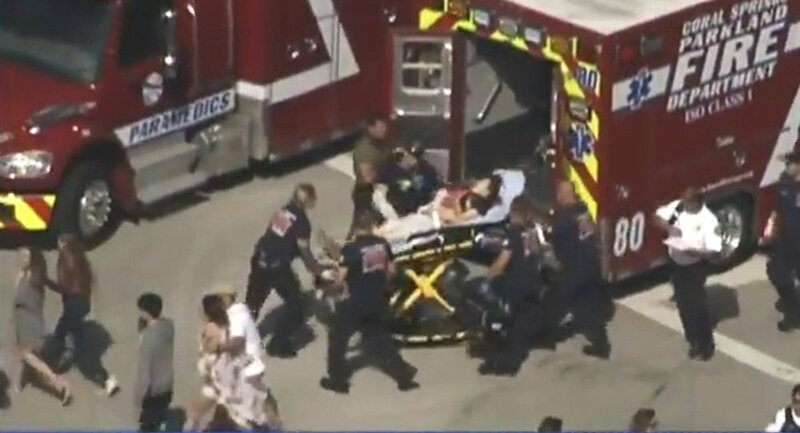 At least 17 people lost their lives and several others were wounded after a lone gunman armed with an assault rifle cut a bloody swathe through a high school in Florida. The 'St. Valentine's Day Massacre' was an infamous Chicago mafia shooting in the 1920's which claimed seven lives and came to epitomize the criminal violence of the prohibition era. However, a disgruntled teenager managed to perpetrate an even deadlier attack, at Marjory Stoneman Douglas High School in Parkland, Florida on Wednesday, February 14, at about 2 p.m. local time. — Broward Sheriff (@browardsheriff) 14 февраля 2018 г. ​Wielding a semi-automatic AR-15 assault rifle, the perpetrator murdered at least 17 people on the school premises and nearby. At least one person was gunned down on a street near the school. "This is the 291st school shooting since the start of 2013 and the 18th in 2018. We all feel unsafe. What ACTION will you take to protect our children," Shannon Watts, founder of Moms Demand Action, a grassroots organization seeking to address America’s culture of gun violence, said in a tweet to US President Donald Trump. He was charged later in the day with 17 counts of premeditated murderafter being questioned for hours by authorities following the deadliest school shooting in the US in five years. The suspect responsible for the shooting spree was identified by authorities as Nikolas Cruz, 19, a member of the US Army's Junior Reserve Officers' Training Corps (JROTC) program and a former student at the very school he attacked. I find it so troubling that Facebook & Instagram delete the accounts of murderers. — #ThePersistence (@ScottPresler) 14 февраля 2018 г. ​"There were problems with him last year threatening students, and I guess he was asked to leave campus," a representative of the Broward County Sheriff's Office said, while Jim, a math teacher at Marjory Stoneman Douglas High, added that last year the faculty was told that Cruz "wasn't allowed on campus with a backpack on him." JROTC is a federal program where the US armed services attempt to "instill in students… the values of citizenship, service to the United States and personal responsibility and a sense of accomplishment." An estimated 310,000 high schoolers in the US participate in the program every year. Local police apprehended Cruz in Coral Springs about two hours after he launched his assault and have taken him into custody. — Franklin White (@FranklinWSVN) 14 февраля 2018 г. US President Donald Trump has expressed condolences to the families of the victims of the shooting, saying "No child, teacher or anyone else should ever feel unsafe in an American school." He later stated that there were "so many signs that the Florida shooter was mentally disturbed, even expelled from school for bad and erratic behavior" and called for reporting such instances to authorities. — Donald J. Trump (@realDonaldTrump) 15 февраля 2018 г.